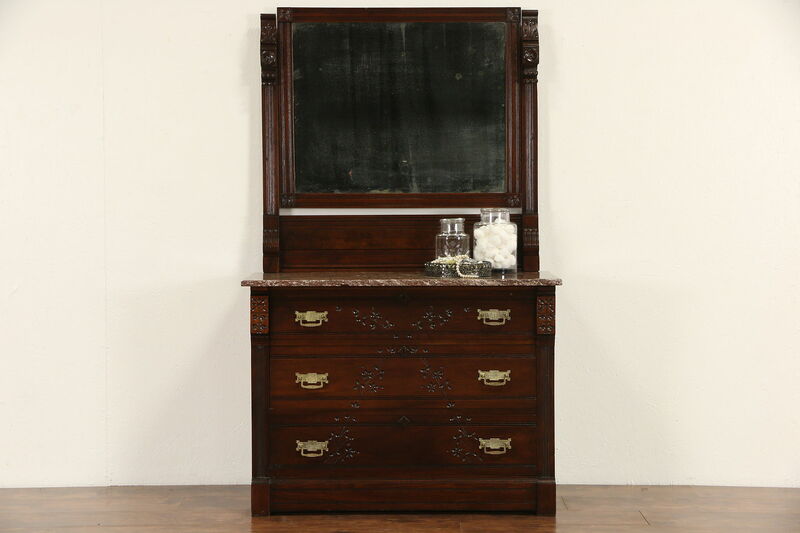 A solid walnut and burl chest or dresser from the late Victorian or Eastlake period about 1870 has an original marble top and embossed brass pulls. A signature on the back reads "L.P. Nickels, Diversey & Clybourne" in Chicago. Newly revarnished, the deep finish is excellent. The marble has been polished and sealed to resist stains on this American made furniture. Drawers have round "pin and cove" dovetail joints of the era. The beveled mirror has antique "smoke" to show its age. Measurements are 40 1/2" wide, 19" deep, 66" tall and the marble is 30" high.